With a magic number of just 87 boxes, 2017 Topps Transcendent Collection Baseball bursts back on the collecting scene for another run! The ultimate in MLB card decadence, each hand-crafted wooden box contains four different one-of-one hits, 50 framed autographs limited to 25 copies or less, and an invitation to a VIP meet-and-greet with the legendary Hank Aaron. 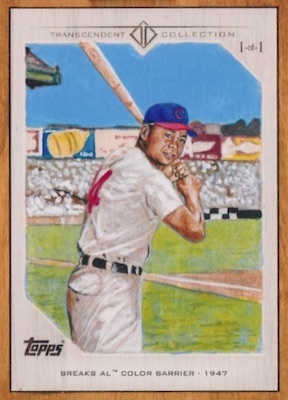 Collectors may recall the hoopla surrounding the 2016 Transcendent set that sold for over $25,000 per box. 2017 pricing remains in the same ballpark. Signed cards do command most of the excitement, but the 2017 Topps Transcendent Collection checklist does not skimp on the other aspects. More specifically, each box includes a full set of the Transcendent Icons base cards. Numbered to 87 copies, these are done with a die-cut wooden border and a silver frame. Collectors also receive a full set of framed MLB Moments Sketch Reproductions. The images come from Dan Bergren, and each set is limited to 87. One original sketch is expected in every box, as well. In addition to the hand-drawn editions from Bergren in MLB Moments Sketches, the Authentic MLB Baseball Sketches are new this year. 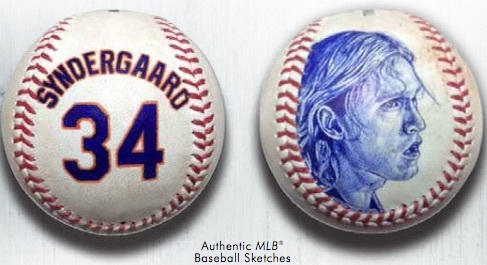 Displaying the artwork of Mayumi Seto and Monty Sheldon, the drawings are actually done directly on an official baseball that features MLB authentication tied to the player in question. 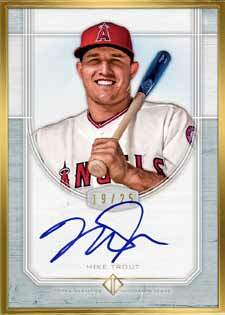 Offering a metallic gold frame, subjects in the 2017 Topps Transcendent Collection Autographs set include current stars, prior legends and future greats. The base version has just 25 copies, while Silver (#/15), Purple (#/10), Red (1/1), and Gold (1/1) tweak the foil accents and background color. 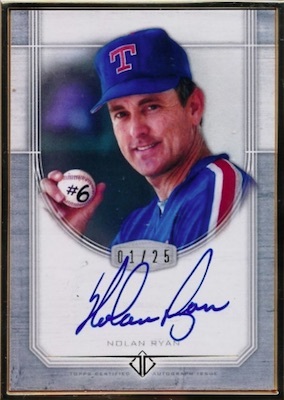 There are also Image Variation Autograph cards (#/25) that swap player photos. All versions combine to fall 50 per box. 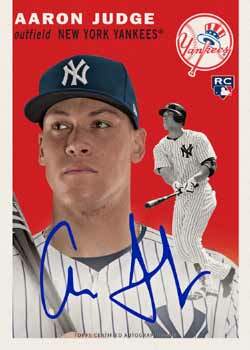 2017 Rookie of the Year winner Aaron Judge gets special treatment in the Topps History Autographs insert that showcases one-of-one autographed designs from 1952 Topps to 2017 Topps. 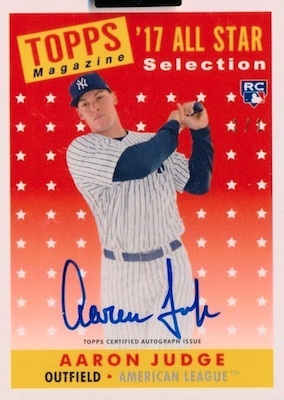 Every box includes one of these Judge autographs. There is also a one-of-one relic version for the 87-card set, but these only come in the VIP party gift bags at one per ticket. 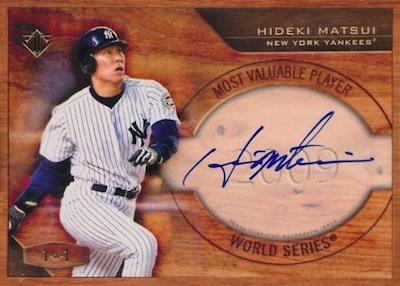 Combining for another box hit, only the most valuable players are found in wood-framed MVP Autographs, MVP Dual Autographs and MVP Cut Signatures. The final autograph in every box is also the largest. 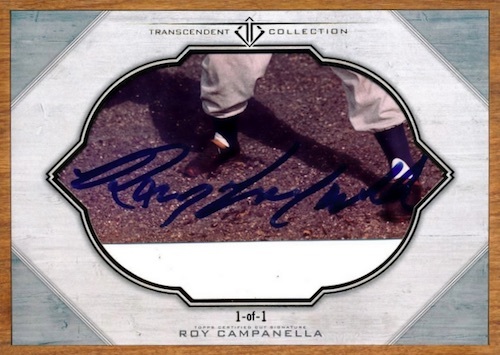 Reaching to the all-time legends of baseball, and beyond, the Oversized Cut Signature cards are all one-of-one editions. In addition to the many cards packed into the premium set, one last treat for 2017 Topps Transcendent Collection Baseball fans is an invitation to the January 16 event in Atlanta, Georgia to meet with the Hank Aaron. This includes hotel stay, a private dinner, picture and autograph with Hank Aaron, and a chance at giveaways. 50 cards. Full set per box. Serial numbered #/87. PARALLEL CARDS: Silver #/15, Purple #/10, Red 1/1, Gold 1/1. 47 cards. Serial numbered #/25. 33 cards. Serial numbered 1/1. 87 cards. Serial numbered 1/1. 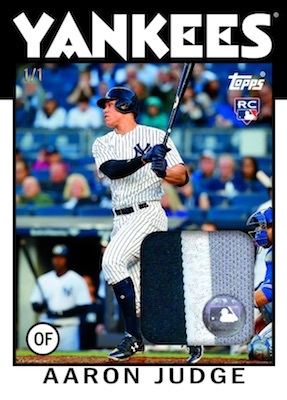 Uses Topps flagship/insert designs from 1951 to 2017. PARALLEL CARDS: Unsigned Relic 1/1 (only in VIP Gift Bags). 87 cards. 1 per box. Serial numbered 1/1. 65 cards. Full set per box. Serial numbered #/87. 65 cards. Serial numbered 1/1. Drawn by Dan Bergren. 22 subjects. Serial numbered 1/1. Drawn by Mayumi Seto and Monty Sheldon. How do we know which cards are the Image Variations? Since they have the same print run and parallels, the only difference is the image and Topps did not indicate which was the variation. It’s more just like there are two main signed versions since variations are normally rare in comparison to the base. Never ceases to amaze me how people throw good money at pigs in a poke. What exactly is different here from most other releases, except the price?